In much of the world having a solid flashlight on hand can be helpful. In Southern California where earthquakes aren’t uncommon and in LA where busted street lights aren’t uncommon are two of those places. Most of my life I’ve had a standard issue MagLight around somewhere and while those certainly do the trick, often they work better as a weapon then a flashlight. I know I’ve I’ve turned someones lights off with one once or twice. But as far as lighting up a dark area they are really too bulky to carry around and the bulbs are kinda flaky. When I decided a few years ago that I wanted something small enough to carry with me but bright enough to light up a whole room, my path lead right to Surefire. I knew of them because they make the best tactical lights for guns, you know the kind that cops and military use to blind the crap out of people before shooting them? Yeah, so when I realized they made small lights you can carry in your pocket I knew that was the right direction. They make hundreds of models in fact, but I decided on the SureFire L4 LumaMax LED mostly because of the size and the LED rather than traditional bulb. If you are a flashlight nut then you’ll be psyched on the 100 lumens it puts off, but the translation for normal people is that it’s bright as hell. Seriously this little guy which fits in the palm of my hand puts off like 20x as much light as my old 4 D cell flashlight. They aren’t cheep, but if you look on ebay you can find deals. There also might be a different model that appeals to you more – some have low and high beam settings, some have sharper casings for use as a personal defense tool as well. They are also pretty modular, so often times you can swap parts from one to another which makes repairs and upgrades, should you need them, kind of a snap. The aluminum bodies are extremely light and if you pick a smaller model you can carry it everywhere and never even realize you have it, thus allowing you to be the hero when you are trapped in a dark stairwell without feeling like you are wearing batman’s utility belt all day. I’ve had this one for close to 3 years and it’s never failed me yet, I’d be psyched if my old maglights lasted 6 months without needing a new bulb. Definitely gets my vote of support. I love my Fenix L0D. 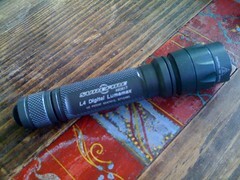 It’s not as bright as you Surefire, it’s max output is 60 lumens, but also has 21 and 7.5 lumen settings. The best part of the L0D is that it’s barely larger than a AAA battery. For me, the LumaMax is just a little too big to fit comfortably in my pocket every day. Oh I’ve got some smaller flashlight goodness coming soon too! Hi. I am neoseikan, the producer of Neofab Legion II, the brightest single LED flashlight. Would you like to introduce this light in your blog? It has 742~748 real torch lumens. neoseikan – I’m only writing about things I own and would recommend, so announcing a product isn’t really something that would fit here.